Heads-up confrontations can occur in any game, even when every seat is occupied. Yet, most hold em players who transition to the heads-up form, especially if they are from full ring no-limit games, do not succeed. Adjusting to the amount of aggression can be difficult since heads-up battles require you to bet and raise with many more hands than what would be considered standard at a full table. 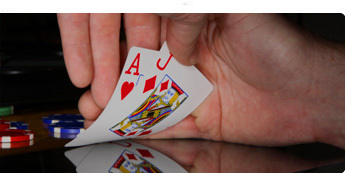 Despite this, no-limit heads-up hold em is growing rapidly, especially on the Internet. So mastering this form of poker can be invaluable for those seeking to add a winning loose-aggressive component to their game. In addition, with the increasing number of heads-up matches now available, becoming proficient in them can be highly profitable. 7. Maximize your heads-up profits through game theory and fundamental business concepts. So whether you are an aspiring heads-up professional, or want to be ready for the next time you re challenged to a one-on-one battle, Heads Up No-Limit Hold em provides you with the tools you need to succeed.